DAY 3 – Sun 31 Mar – Brisbane 8am to 5pm – Brisbane has the culture and skyline of a major metropolis without attitude – with great nature and beaches nearby. Opt for urban explorations or head to the hills, rainforest or renowned Gold Coast for other types of experiences. Lone Pine Koala Sanctuary – spend some quality time with kangaroos and even cuddle a koala. Australia Zoo – discover some of Australia’s most exotic wildlife. DAY 5 – Tue 2 Apr – Airlie Beach 7am to 6pm (tendered) – this laidback town on the Coral Sea is the perfect base for exploring the spectacular archipelago of the Whitsunday Islands and the aquatic wonders of the Great Barrier Reef. Village life revolves around nature, the beach and sea. The Great Barrier Reef – explore the world’s largest collection of corals, coral sponges and molluscs. The Whitsunday Islands – covered by lush landscape and bordered by gorgeous beaches and coral-laden waters. Whether you’re looking to windsurf or sail – swim, snorkel or scuba dive the Great Barrier Reef. Find a palm-fringed beach to read and relax. Visit the World Heritage Rainforest. Or spend the day exploring Carins. You’ll find it here. Tropical North Queensland – explore wetlands, rainforests and 500 different species of eucalyptus. Crocodile Attack Show – Witness a world-famous feeding frenzy (without becoming croc-bait). 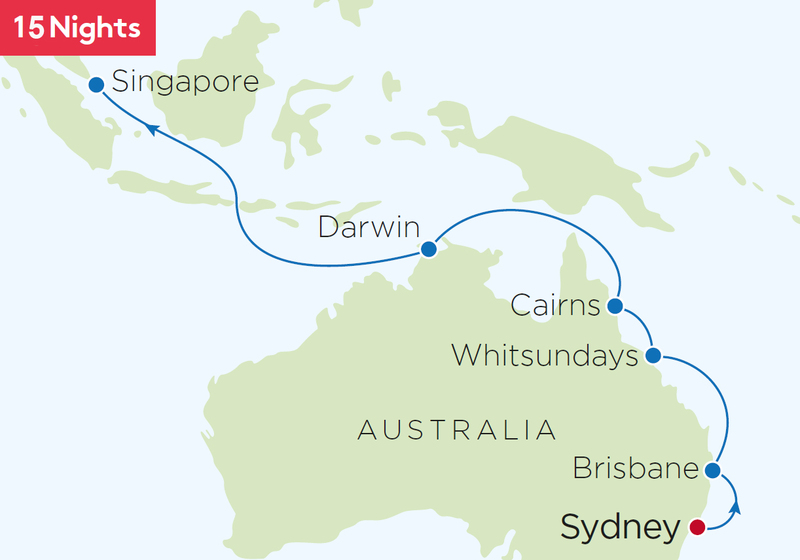 DAY 10 – Sun 7 Apr – Darwin – arrives 10am stays overnight – Darwin is a fast-growing city with a melting-pot culture, modern look and laid-back air. The urban action is centred around the revitalised waterfront, while the Northern Territory’s untamed landscapes and wildlife are close by. Indo-Pacific Marine Exhibition – explore the underwater realm of the Northern Territory. Adelaide River – you might just come face to face with the famous Jumping Crocodiles. Visit the Darwin Military Museum – and other sites relating to the coming of the Pacific war to Australia on 19 February 1942 – and beyond. DAY 16 – Sat 13 Apr – Singapore, arrive 8am – filled with glittering skyscrapers, Singapore practically hums with business and trade. You’ll also find multi-ethnic culture, great cuisine and attractions that include modern malls, traditional shops, colonial buildings and historic temples.